Rheumatic and musculoskeletal diseases (RMDs) are understood to reduce levels of paid productivity. Productivity, including absenteeism and presenteeism, is arguably an important factor for consideration in economic evaluations of workplace interventions for RMDs (WPI-RMDs). Existing methods available to quantify and value absenteeism and presenteeism are heterogeneous and produce estimates that vary substantially across studies. To date, there has been no systematic summary of the reporting quality of methods used to quantify paid productivity included in economic evaluations of WPI-RMDs. The aim of this systematic review was twofold. First, the review was conducted to understand if, and how, the impact of WPI-RMDs on productivity was considered and incorporated in published economic evaluations. Second, we aimed to assess the reporting quality of productivity in published economic evaluations of WPI-RMDs and determine the need for a published set of reporting guidelines for productivity. This systematic review was conducted in line with the Preferred Reporting Items for Systematic Reviews and Meta-Analyses (PRISMA) guidelines. A systematic review published in 2008 that focused on the cost effectiveness of WPIs, with limited information on productivity, was updated from 2007 to July 2018. A global search was conducted using three online databases: MEDLINE (1946 to August 2018, week 2), EMBASE (1974 to 10 July 2018); and EconLit (1886 to July 2018). The studies were double-screened by four independent reviewers. Data extraction was conducted using a bespoke data extraction table. Twenty-one economic evaluations of WPI-RMDs were identified. All studies evaluated absenteeism, but only five reported on levels of presenteeism. The methods used to identify and measure absenteeism were fairly consistent; however, methods used to identify and measure presenteeism, and value absenteeism and presenteeism, varied across studies. Two studies may have potentially double-counted productivity in their economic evaluations of WPI-RMDs. The results of this systematic review identified key elements potentially useful as a starting point to inform reporting quality guidelines for productivity. Variation in the methods used to quantify productivity and how it is reported in economic evaluations suggests the need for specific published reporting guidelines for productivity. The development of standardised reporting guidelines for the identification, measurement, and valuation of absenteeism and presenteeism in economic evaluations may help reduce variation in the methods and promote transparency. The online version of this article ( https://doi.org/10.1007/s40258-019-00473-8) contains supplementary material, which is available to authorized users. The authors would like to thank Professor David Coggon and Professor Karen Walker-Bone from the Centre for Musculoskeletal Health and Work, Southampton, for providing their feedback and comments. They would also like to thank Peslie Ng’ambi for double screening the studies identified. Cheryl Jones created the search strategy, conducted the search, screened the titles and abstracts of all identified studies from the search, identified relevant full-text articles, extracted the data of the relevant studies, wrote the manuscript, and contributed towards the idea for the systematic review. Suzanne Verstappen screened the titles and abstracts of all relevant studies identified by the search, contributed towards the motivation for conducting the review, and provided comments on previous draft versions of the manuscript. Katherine Payne screened the titles and abstracts of all relevant studies identified by the search, made the final decision to include or exclude studies where discrepancies arose, made a significant contribution towards the idea and motivation for conducting the systematic review, and provided substantial comments on previous draft versions of the manuscript. This work was supported by Arthritis Research UK and the Medical Research Council (20665). Cheryl Jones, Suzanne Verstappen and Katherine Payne declare that they have no conflicts of interest. Parsons SIM. A heavy burden: the occurrence and impact of musculoskeletal conditions in the United Kingdom today. Manchester: Arthritis Research UK Epidemiology Unit; 2011. https://www.escholar.manchester.ac.uk/uk-ac-man-scw:123774?style=librarysearch. Cited 4 May 2017. Health and Safety Executive. Working Days Lost; 2017. http://www.hse.gov.uk/statistics/dayslost.htm. Accessed 13 Dec 2017. Public Health England. 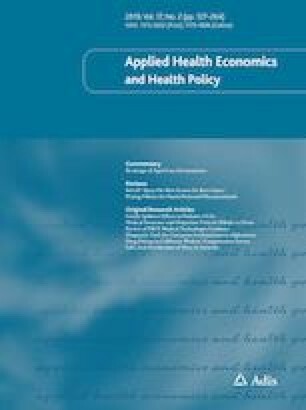 Local action on health inequalities: workplace interventions to improve health and well-being. PHE Publications; 2014. https://www.gov.uk/government/uploads/system/uploads/attachment_data/file/355773/Briefing5a_Workplace_interventions_health_inequalities.pdf. Hemp P. Presenteeism: at work—but out of it. Harvard business review; 2004. https://hbr.org/2004/10/presenteeism-at-work-but-out-of-it. Cited 11 Dec 2014. NICE. Guide to the methods of technology appraisal 2013 | 1-introduction | Guidance and guidelines | NICE; 2013. http://www.nice.org.uk/article/pmg9/chapter/1-introduction. Cited 20 Dec 2014. NICE. Diagnostics assessment programme. NICE; 2011. https://www.nice.org.uk/about/what-we-do/our-programmes/nice-guidance/nice-diagnostics-guidance. Cited 21 Nov 2018. Hillage J, Rick J, Pilgrim H, Carroll C, Booth A. Evidence review 1: review of the effectiveness and cost effectiveness of interventions, strategies, programmes and policies to reduce the number of employees who move from short-term to long-term sickness absence and to help employees on long-term sickness absence return to work; 2008. http://www.nice.org.uk/nicemedia/pdf/PH19evidenceReview1.pdf. Accessed 15 Aug 2017. Netherlands S. Jobs (outstanding, new and filled). Centraal Bureau voor de Stastistek; 2012. http://statline.cbs.nl/StatWeb/publication/?VW=T&DM=SLNL&PA=80857NED&LA=NL. Accessed 25 Feb 2019.
International Society for Pharmacoeconomics and Outcomes Research (ISPOR). Pharmacoeconomic guidelines around the world. https://www.ispor.org/PEguidelines/index.asp. Cited 23 May 2017.